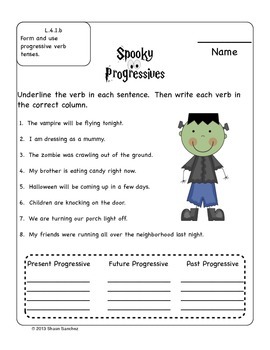 Spooky Progressive Verbs is a unit that has been specifically aligned to Common Core standards 4.L.1.c. 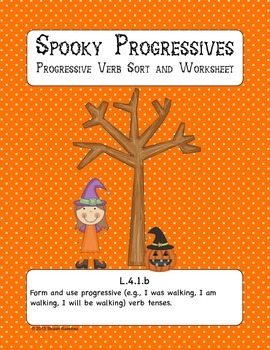 This pack focuses solely on progressive verbs. Two worksheets that can be used as either a summative or formative assessment or independent seat work. A file folder game that is perfect for a center or independent seat work. The file folder game is a Halloween themed verb sort that includes a recording sheet. 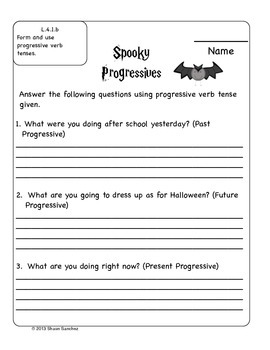 The first assessment asks students to answer questions using the correct progressive tense verb in the answer. 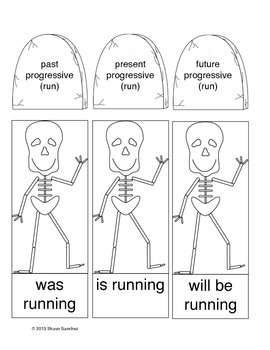 The second assessment asks students answer questions using a stated progressive verb form.